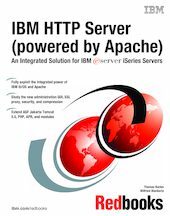 This IBM Redbooks publication helps you to plan, install, configure, troubleshoot, and understand the HTTP Server (powered by Apache) running on the IBM eServer iSeries server. It introduces the HTTP Server (powered by Apache) and identifies all the necessary components to install and configure your first Apache-based Web server running on your iSeries server. It includes a quick guide to the Apache contexts and request routing. It also introduces the iSeries’ unique graphical user interface (GUI) for further configuration and customization. This book explains how to use virtual hosts, secure your server, and serve dynamic data with server-side includes (SSI), Common Gateway Interface (CGI), Net.Data, and Hypertext Preprocessor (PHP). It details the steps required to implement Web application serving with Java featuring the Apache Software Foundation’s (ASF) Jakarta Tomcat. Advanced topics include how to achieve the best performance by using local caches, mod_deflate, Triggered Cache Manager (TCM), and Fast Response Cache Accelerator (FRCA). This book also introduces the Webserver Search Engine, problem determination, high availability (HA), and national language support (NLS) considerations. It includes an example of extending the core features of your HTTP Server (powered by Apache) via Apache Portable Runtime (APR) support. To complete the discussion, this book includes appendices about bringing PHP and Tomcat Version 4.1 to your iSeries server, and bringing Zip and Unzip functions to the OS/400 Portable Application Solutions Environment (OS/400 PASE) and Qshell environments.